The renascent interest in various religious traditions has coalesced with other factors to present a unique opportunity for the establishment of a preeminent center for early Christian studies at the University of Michigan. The discovery of the Dead Sea Scrolls in Israel and the Nag Hammadi Texts in Egypt offered the promise of advancing scholarly studies in early Christianity. The study of these texts has yielded greater understanding of the diversity of early Christianity, the many aspects of its beginnings, and of the contemporaneous religious ideas and currents that were related to the Christian movement. The texts provide insight into the relationships of Jewish groups and religious ideas at the time of Jesus. The teachings of Jesus can now be studied as part of the Jewish diversity of the 1st century. And at the same time we can begin to understand Jesus as a Jewish teacher/rabbi involved in the religious discourse of his age and as one initiating a new, involved community and movement. As the Dead Sea Scrolls and the Nag Hammadi texts have become more accessible to the community of scholars and the general public over the years, interest in the texts and their import for early Christianity has significantly increased. This greater accessibility has stimulated scholarly study and impressed issues related to Christian origins on the popular consciousness across the United States and Europe. The talent and support necessary to establish and maintain an internationally recognized center for early Christian studies can therefore be developed at present better than ever before. Currently at the University of Michigan, hundreds of students now attend undergraduate courses in Christianity, and student demand for these courses will likely increase for the foreseeable future. These undergraduate courses not only provide students with a better understanding of Christianity, but generate interest in early Christian scholarship as a career. The University of Michigan is uniquely positioned to capitalize on the opportunities presented and to serve as the venue for a preeminent center for early Christian studies. The University ranks in the forefront of the nation’s professional schools and other academic disciplines, ranging from law, business, medicine, and engineering to political science, sociology and psychology. The international stature of the University of Michigan provides obvious credibility to any endeavor, and will attract the most accomplished scholars and students. Not surprisingly, the University already possesses a great measure of the talent, resources, and infrastructure necessary to establish and support an internationally recognized center for early Christian studies. The University has assembled a core of eminent specialists who can serve as a nucleus of such a center providing they receive adequate financial resources to establish the programs that would be maintained by such a center. This nucleus can attract other leading scholars to the center. The University of Michigan also maintains one of the largest papyrus collections in the world, including a world-renowned collection of New Testament papyri, fragments of texts, and other vast papyrus resources directly related to early Christianity and the Greco-Roman world. Further, an excellent program in classical studies (Greco-Roman) exists at the University, in addition to outstanding, established and well-funded programs in Judaic and Islamic studies. In recent years, the University of Michigan has distinguished itself as one of the leading centers in the research of second temple Judaism—the period of Judaism in which Christianity developed. The University has gained an international reputation in this area, both as a result of its field research and its development of a seminal series of international meetings that have revivified the study of this field. For example, annual meetings called the Enoch seminar were instituted and developed by Professor Gabriele Boccaccini at the University of Michigan to bring together the foremost international scholars and specialists in second temple Judaism and Christian origins from United States, Europe, and Israel. The Enoch Journal, founded in 1979 at the University of Turin and now centered at the University of Michigan, is the foremost international journal devoted to the study of second temple Judaism and Christian origins. These programs and accomplishments provide an opportunity to engage in an interdisciplinary approach to the study of early Christianity that will enhance the understanding of the early development of Christianity. Such an approach will also provide greater understanding of the cultural and religious milieu in which Christianity arose and developed, and in the dynamic interaction of the common and distinctive elements in the development of Judaism, Christianity and Islam. The University of Michigan is structurally positioned to accommodate and develop a major center for early Christian studies that adopts an interdisciplinary approach. Unlike most other universities, the University of Michigan houses the study of all three major religions in the same department—the Department of Middle East Studies. This structure would facilitate cooperative and dynamic interaction among scholars within these religious study programs. Further, the strong, existing program, Christianity in the Greco-Roman World, maintains affiliations with the Interdepartmental Program in Classical Art and Archaeology, the Interdepartmental Program in Greek and Roman History, the Kelsey Museum of Archaeology, the Department of Classical Studies and the Frankel Center for Judaic Studies. Thus, the existing structures at the University of Michigan are uniquely suited to support a preeminent early Christian studies center, and to facilitate “cross-pollination” and other synergies to enhance and develop such a center. Finally, a model for such a center currently exists at the University of Michigan. Since 1976, the Frankel Center for Judaic Studies has promoted Jewish Studies at the University of Michigan as an interdisciplinary endeavor drawing upon scholars throughout the University and engaging undergraduate and graduate students and the wider community. More recently, the Center established the Frankel Institute for Advanced Judaic Studies, which brings together leading scholars from around the world for a year of intense cooperative study and teaching. These efforts have established the University of Michigan as one of the premier centers for Judaic studies in the world. 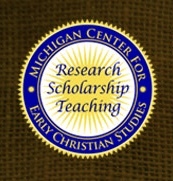 By studying and selectively applying similar infrastructure, programs and methods of the Frankel Center and Institute and by obtaining adequate financial resources, the Michigan Center for Early Christian Studies can assist in establishing a preeminent, internationally recognized center for early Christian studies at the University of Michigan. The Michigan Center for Early Christian Studies considers the study of early Christianity to include the development of Christianity from its 1st Century origins in Judaism up to and including the rise of Islam as a critical field to be developed at the University of Michigan. This period of immense importance to humanity is crucial for understanding the common and diverse cultural and religious elements and ideas that have been so important in shaping our contemporary world. Please consider joining us in this effort. Contact us to receive our free newsletters. Consider making a donation to the Center to develop the study of early Christianity at the University of Michigan.